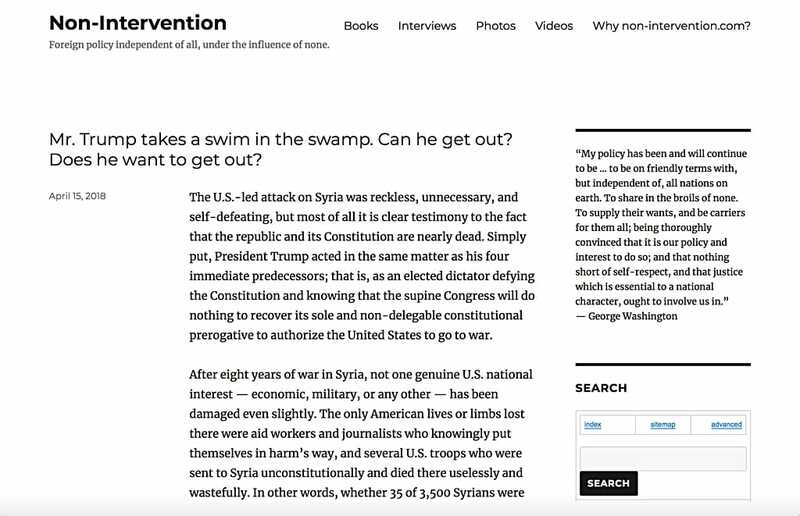 Sometime in the third week of July 2018, GoDaddy de-platformed Michael F. Scheuer’s “Non-Intervention.com” website. I had only visited his site sporadically over the years, mostly because he was preaching to the choir where I am concerned. During my infrequent visits, I noted both that Scheuer was using WordPress, and that he was not terribly fluent in its ins and outs. Therefore, when a friend alerted me that Scheuer’s site was off the air, I had to wonder if Scheuer himself had a back-up of his site, or even the source material that had gone into it. I therefore started looking for traces of his site postings across the Internet. I know they say that once something is on the Internet, it never really disappears, but his site did a pretty good job of it. Hence, I was able only to recover these items. I know I am missing some items (see the list), but I fear there are many other items that have disappeared essentially without a trace. I gathered up what I could, stripped out all kinds of HTML cruft in an attempt to get to the actual page content, and then one-by-one, re-entered each item into a local instance of WordPress running a more modern theme, making use of some of the wide array of tools and features of WordPress for formatting. This gave me a pretty “clean” and presentable version of the files, which I then exported to a static site using a custom WordPress theme I developed, which produces files with less cruft, the result being a set of files I can more easily manipulate in BBEdit. I then further processed these files to remove some of the incredible amount of HTML cruft with which WordPress lards its pages, installed a site search (courtesy FreeFind.com, and did other hand-tuning of the code. 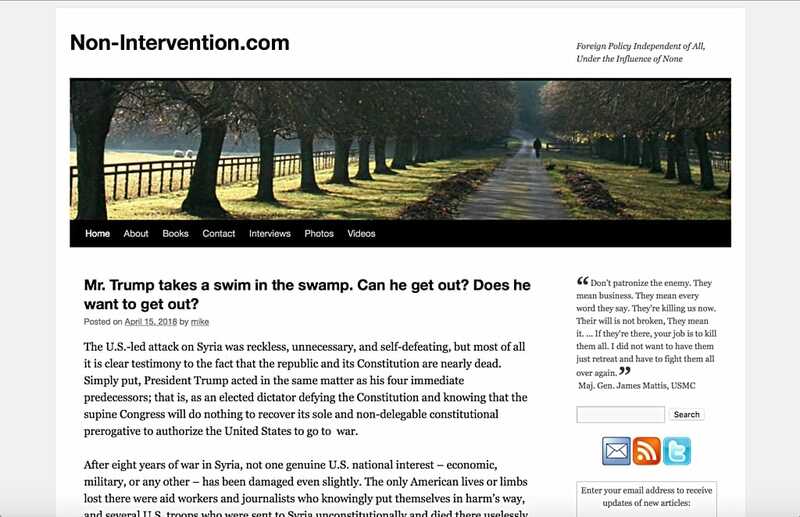 Scheuer has since re-constituted his online presence at Non-Intervention2.com. I have sent him unbidden a copy of the WordPress XML export file from my local instance, for import into his new site.